I know, I know, I’m late to the Sew Dolly Clackett party. 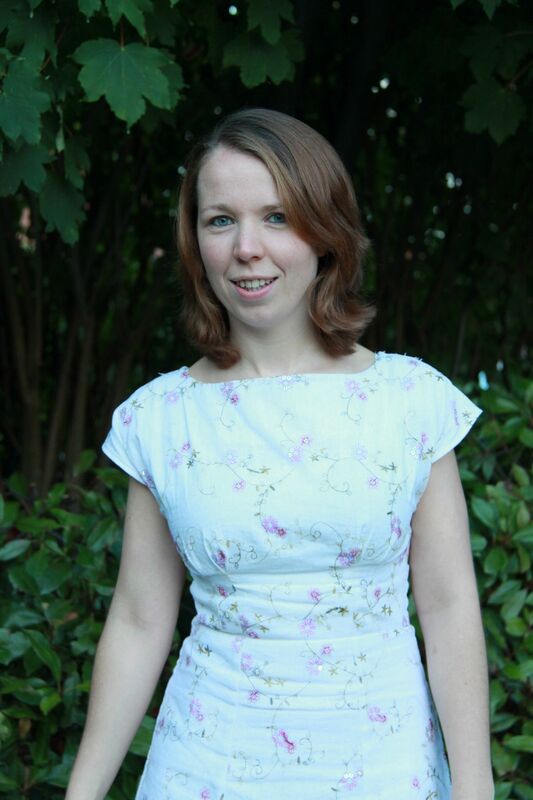 Sew Dolly Clackett is the brainchild of Sarah from Rhinestones and Telephones – getting sewists worldwide to create a dress emulating the style of Roisin as a wedding present to her and Nic. And it’s a great excuse for us all to create a dress in Roisin’s fabulous style – colourful, often novelty, prints, and well-fitting dresses! Although I said in my post on trying to get the fit right on this dress that I was going to forget about the deadline, and just focus on getting a great fitting dress, when more and more Sew Dolly Clackett dresses started popping up in my blog reader (you can see them all in the Flickr group), the temptation to get it finished in time was too strong, and I knew I had to give it a good go. I had a bit of time over Easter weekend (turns out, not as much as I’d planned, isn’t that always the way?!) and I managed to make some pattern adjustments, sew up a new toile, and get the dress almost completely finished, other than the zip and the hem. I didn’t think I’d have any problem getting those done before the deadline on Wednesday. Famous last words. Anyway, I’ll get to that, let’s go back to where we left off in the my last post. 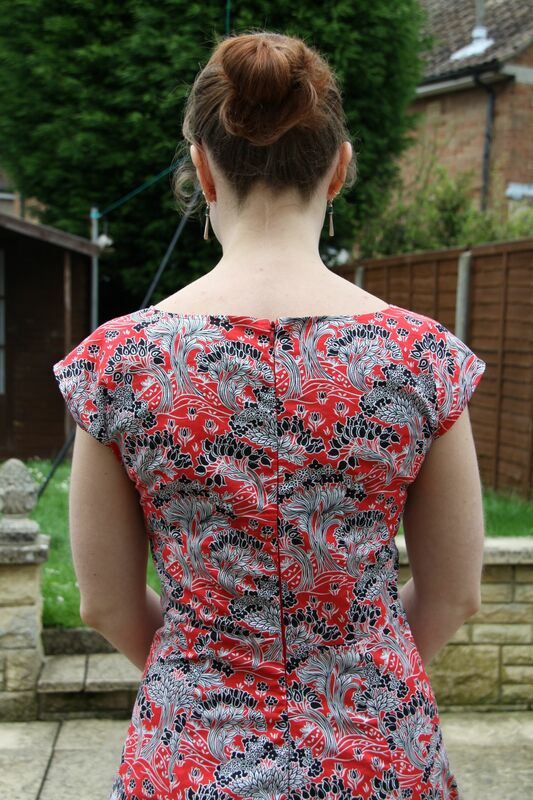 I’d sewn up a toile in a UK size 10, but had a lot of excess fabric across the chest and the back. Thank you all for your helpful comments on that post, I did a lot of research, reading about other people’s fitting issues, and how they’d fixed them (Neeno’s and Sonja’s were especially helpful). Taking the wedges out the top of the neckline would have been straightforward enough, but I just couldn’t work out a way to take out the excess by the sleeves – all the excess was in the middle of the fabric, not at the edges, so taking out a wedge wasn’t going to work. I spent quite a while trying to get this to work, but it just wasn’t happening – I couldn’t find a way of doing it where I was happy with the result. Due to the fact that the toile fitted well across and under the bust, and all the excess seemed to be in the upper chest, I wondered whether it would work if I tried grading out the sizes. I retraced my pattern (for about the 4th time, ughh! 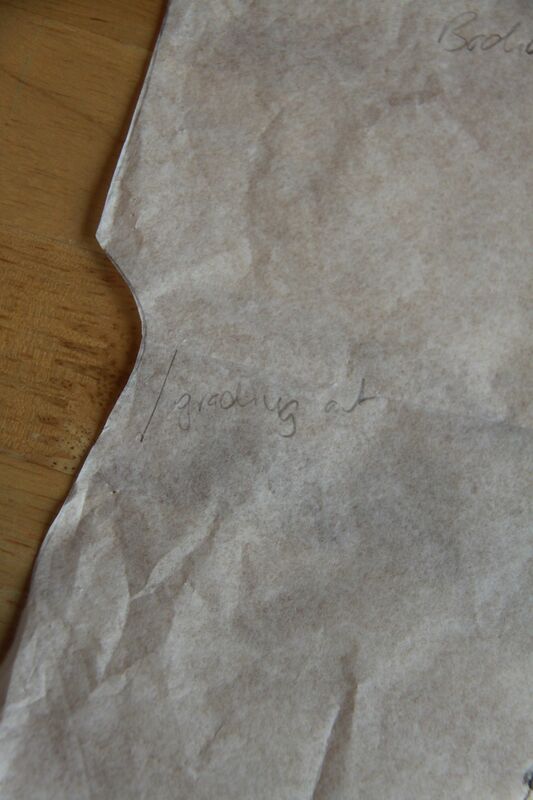 ), tracing off the 8 for the top half, grading out to the 10 just under the bottom of the sleeves. 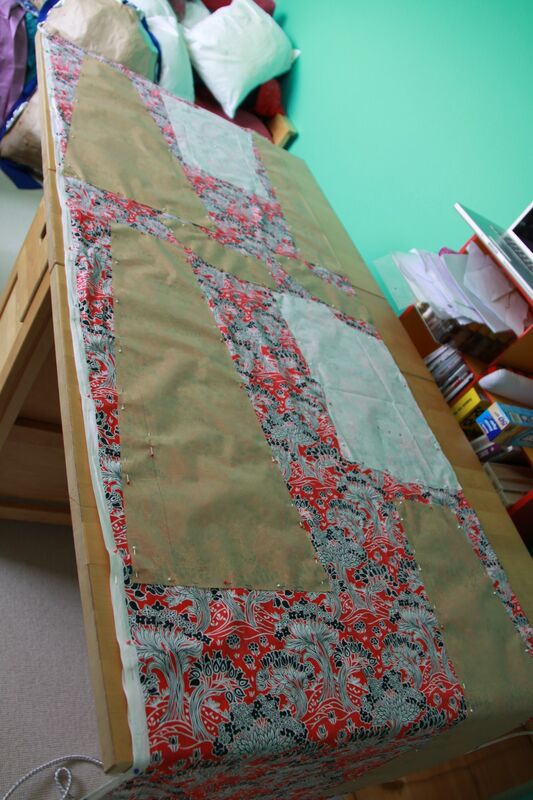 I fudged it a little bit – on the pattern piece, the shoulder line of the 8 sits above that of the 10. I stuck with the line for the 10 here, but then only extended it out as far as the 8. 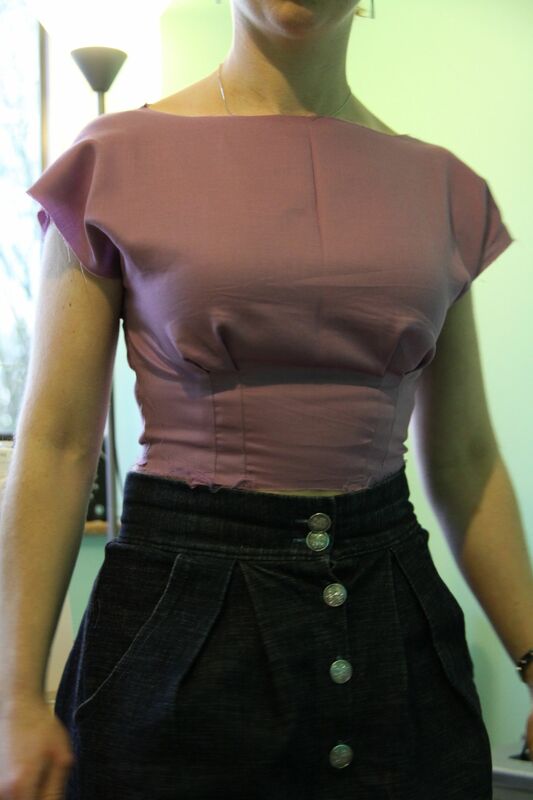 I also did a narrow back adjustment on the back bodice piece, taking out half an inch on each side of the bodice – this was something that was picked up when I did my fitting course, and as there seemed to be excess fabric all the way down the back, I thought this would help. I didn’t do any other adjustments at this stage – I thought that I might need to, but decided to work those out once I had sewed up the toile. As it turns out , I didn’t need to :) The fit of the toile was pretty good, a definite improvement on the last one. It was actually a little tight now, so I let out the side seams a bit, sewing them up with 3/8 inch seam allowance instead of the usual 5/8, and that was enough to fix the issue. I also put the zip in by lining up the edge of the fabric with the zipper tape, rather than using a larger seam allowance here. 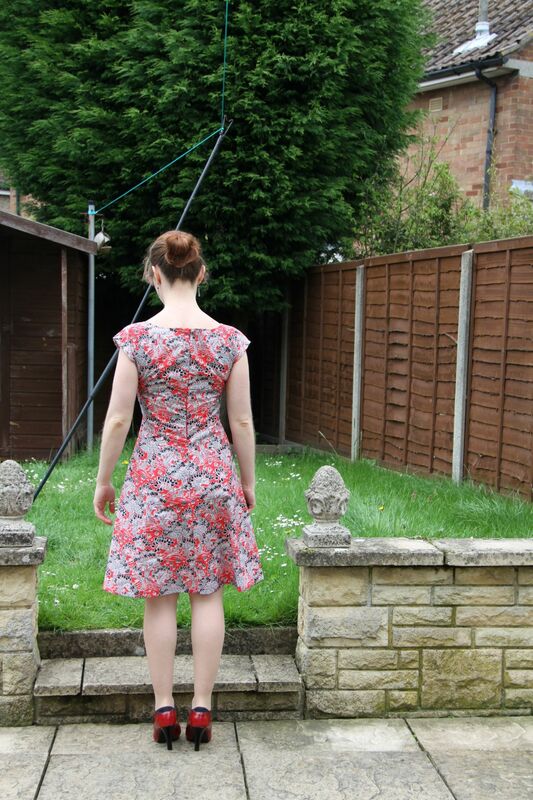 I was happy enough with this fit to get straight onto making the actual dress – yay! 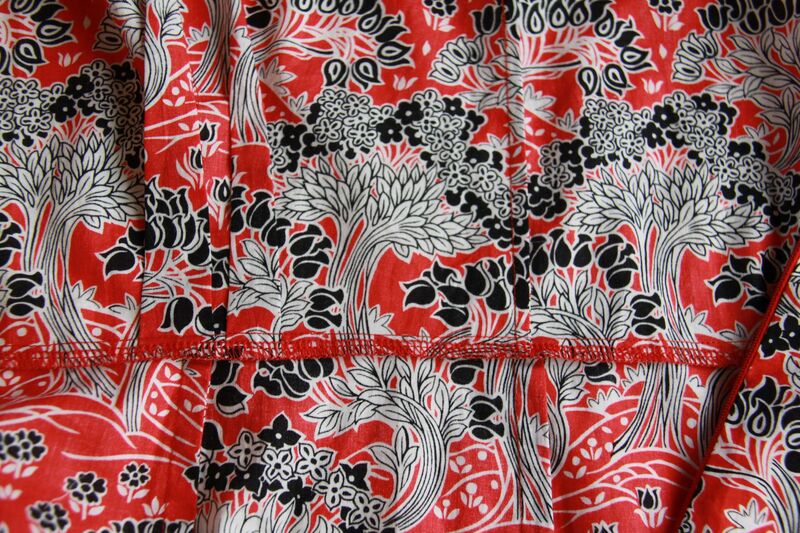 I bought this fabric when I went to Goldhawk Road in March. 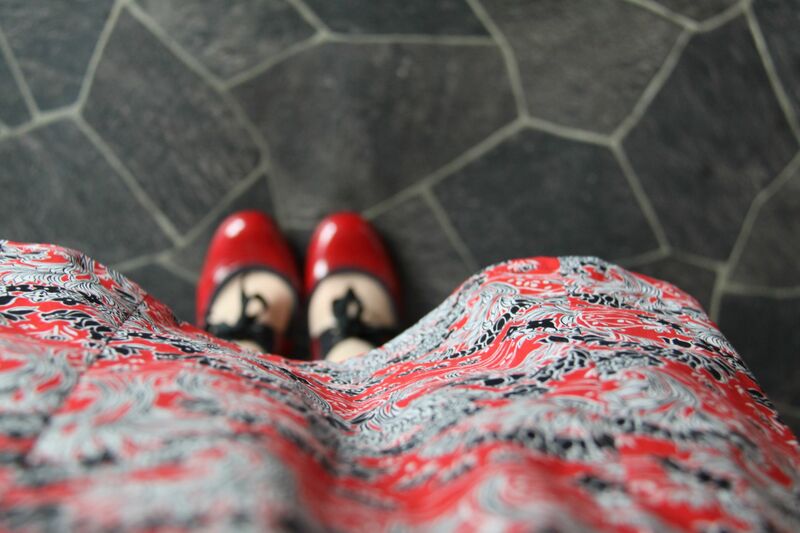 The colour of the fabric I chose was entirely determined by the only pair of Roisin-worthy shoes I own! I chose to make another By Hand London Anna, which is one of many patterns that Roisin has made multiple times. Her swimmers Anna was one of the first ones I saw that made me decide I needed to make this pattern! 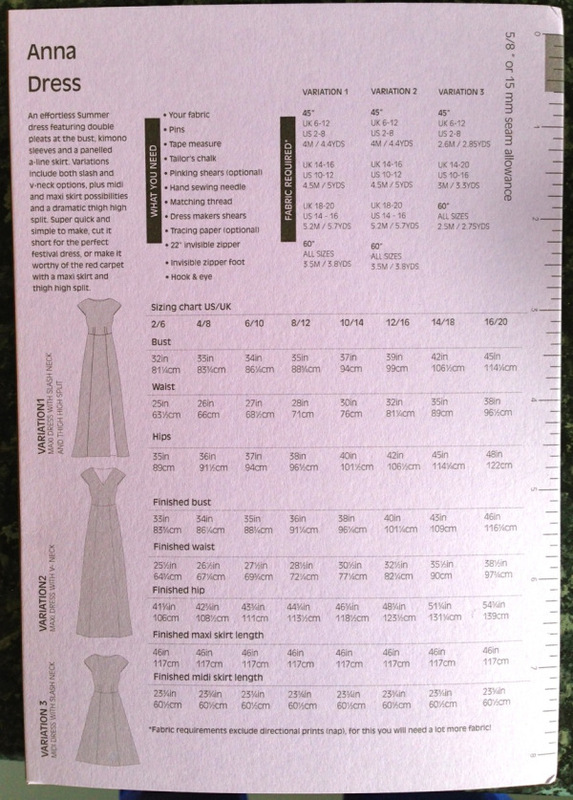 The pattern specifies that for a size 10, midi length Anna, you need 2.6m of fabric. I knew, based on my last Anna, and other people’s comments, that this was an over-estimation, so I bought 2 metres of this cotton lawn from Classic Textiles, for £7/m. It wasn’t until I got home that I realised that this fabric was a directional print and so, according to the pattern, I’d need significantly more. This threw me into a bit of a panic, I had a vision in my head of Anna made up in this fabric, and wasn’t going to be going anywhere near Goldhawk Road again to get any more :( But I decided to lay out the pattern pieces and double check that I didn’t have enough. Turns out I did! 2m of (50″ wide, so not sure if this would work with 45″) directional print fabric is enough to make a By Hand London Anna :) That made me very happy! I’ve even got some pretty decent sized scraps left over. 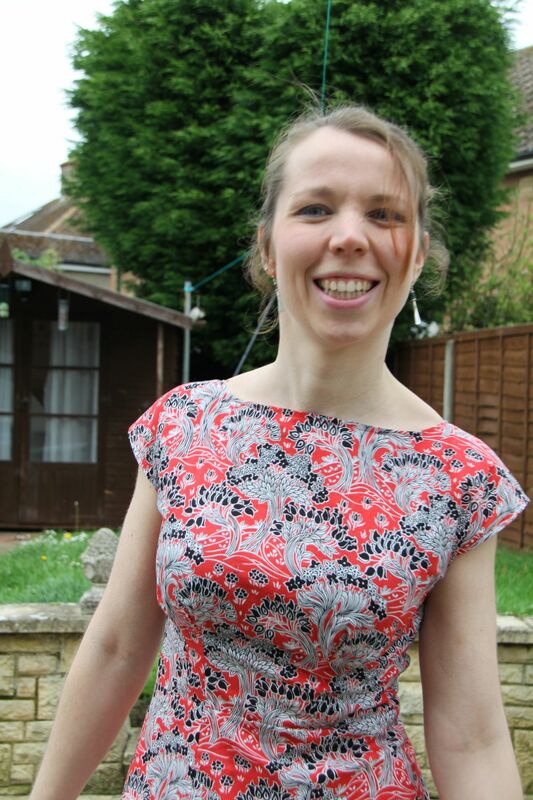 Most of the rest of sewing up the dress went without a hitch – I said it last time I made this dress – this is a lovely pattern to sew up – it’s one of the quickest sews I’ve had. I used French seams throughout. 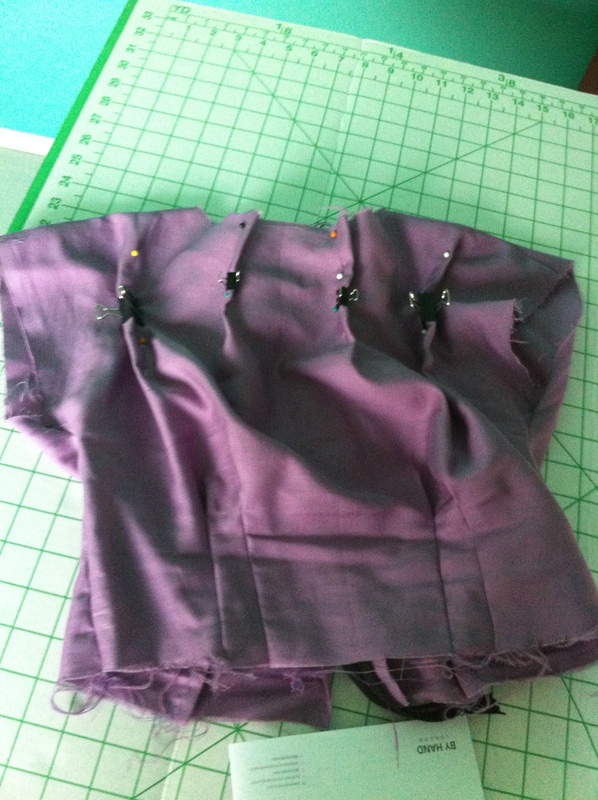 I didn’t think I’d be able to on the reduced bodice side seams, but just about managed. 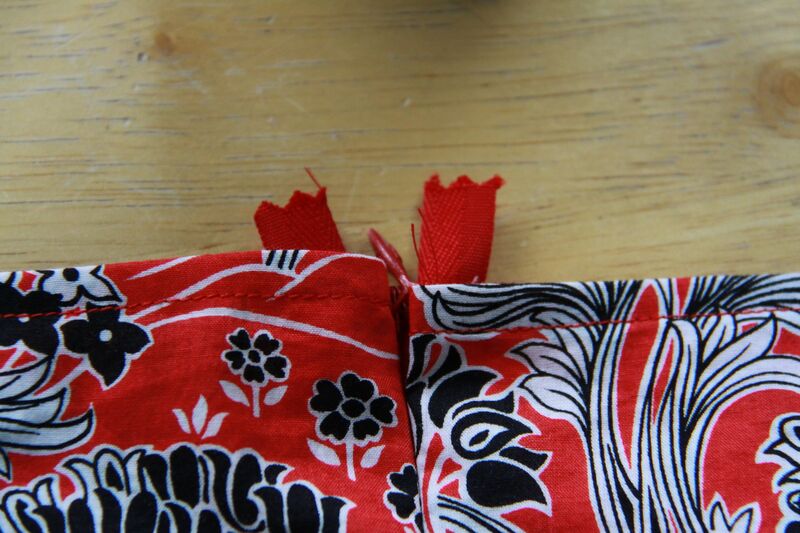 I then overlocked the edge of the facing, and the waist seam. All was going well until I tried to insert the zip on Wednesday evening. I know invisible zips get a lot of bad press, but I have to say, I have never had a problem with them. I use an invisible zip foot, and they have always gone in beautifully – no zipper tape showing at all – truly invisible. But of course, the one time I needed to get a dress finished for a deadline…I don’t know why it wasn’t work – every time I put it in, the stitching was either way too far out from the teeth, so that a few mm of zip tape was visible on either side of the zip when done up, or, when I tried to get the stitching closer, I ended up sewing through some of the teeth, so it wouldn’t do up. After 4 unsuccessful attempts, I took Claire’s advice and took a break from it. But after cooking dinner, I just didn’t have the energy go back to it. So I had to admit defeat at getting it into the sewalong on time, but I knew that I wasn’t going to get a good result by rushing it. Slight wrinkly back, but I’m not going to let that bother me! 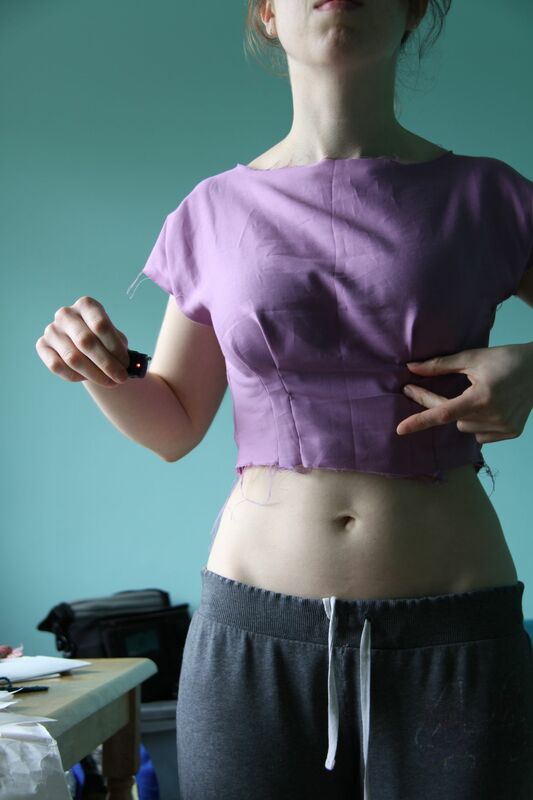 I had some time to go back to it on Saturday, and FINALLY managed to get the zip in in a vaguely acceptable fashion. 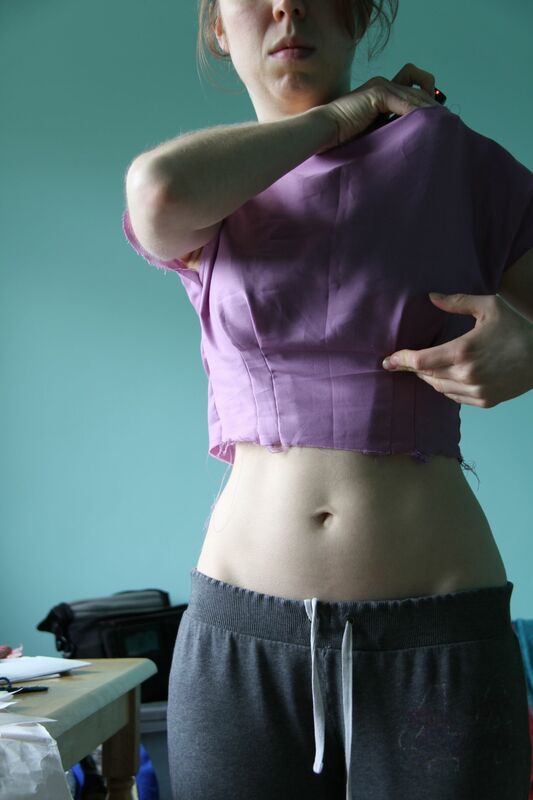 Still not perfect, there’s still a bit of zipper tape visible around the waistline, but it was good enough. There was only one problem with the zip insertion – the top of the dress didn’t quite line up (neither did the waistline or the hem, by even more). It was only about 4mm out, and I was going to leave it as it was (I had finally got the zip in, I felt I ought to take that and run! ), butttttt…I decided to re-do one side of it to get it to line up better. Luckily the zip went in ok again this time, and the top of the dress is now lined up, although the waistband and hem were still a little off. I had already taken 1 3/4 inches of the bottom of the hem, so I just trimmed off the excess from one side to make it even, and then turned it up by the specified amount. My previous Anna dress was a bit long for my liking, but this one is just right, hitting at my knees. 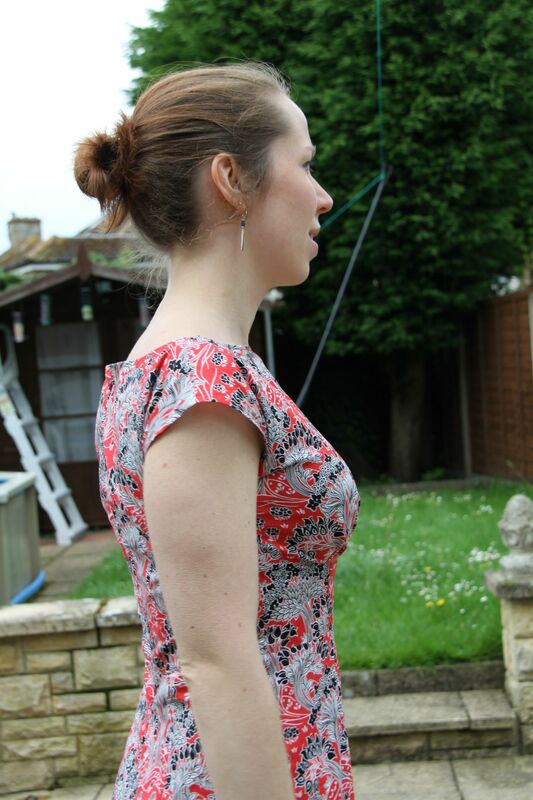 As you can see from the photos, the fit on this dress is pretty spot on – I’m absolutely delighted with it. I think it’s safe to say that this is the best fitting garment I’ve made – it was definitely worth the time it took to get the fit right. And because a dress wouldn’t be a Dolly Clackett dress without a name, I’m calling this one the ‘Get me to the church on time’ dress. Maybe next time I will make it! I am, and I’m sure many other sewists are too, really grateful to the competition for encouraging us to sew up a dress in a print that we might normally not have chosen. 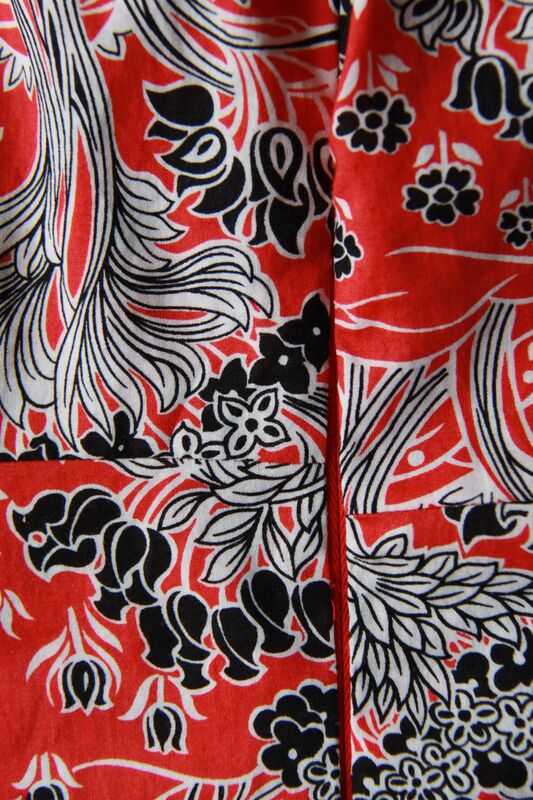 I love my dress, and I do have the fabric for another Sew Dolly Clackett dress lined up as well. My dress may not have made it to the wedding, but it’s in it for the marriage. I wish Roisin and Nic all the best for theirs. I have today off work, and was planning on using the time to try and make some headway on my Sew Dolly Clackett dress, for which I’m making a By Hand London Anna. I’ve made an Anna before, and although I love it, I did not get the fit right. Nothing drastic – it could definitely have done with an FBA, but other than that there weren’t really any issues. I decided that, this time round, I was going to try and get the fit right. I initially thought I’d need to do an FBA, but then I looked again at the measurements, and thought that maybe I could get away without. 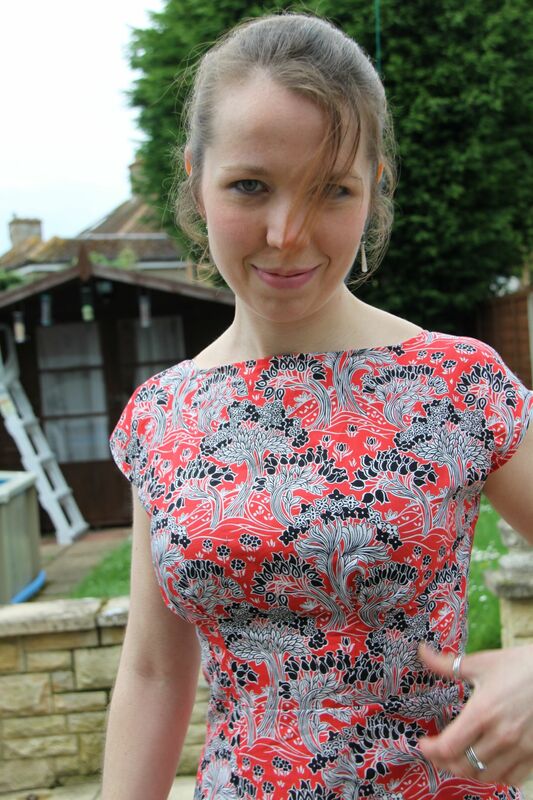 Last time I made the dress I made US10/UK14, which fitted my measurements – 37 inch bust and 30 inch waist. 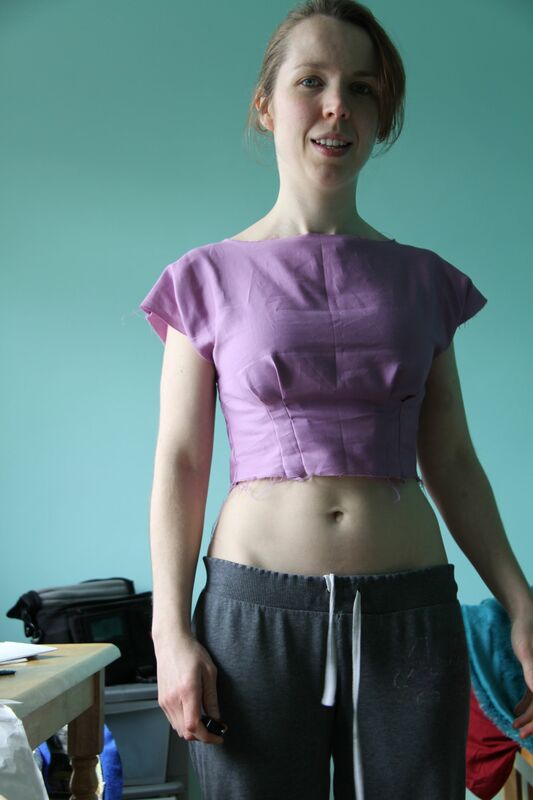 But at the time, my upper bust measurement was only 34 inches, so I should probably have made a US6/UK10, with an FBA. 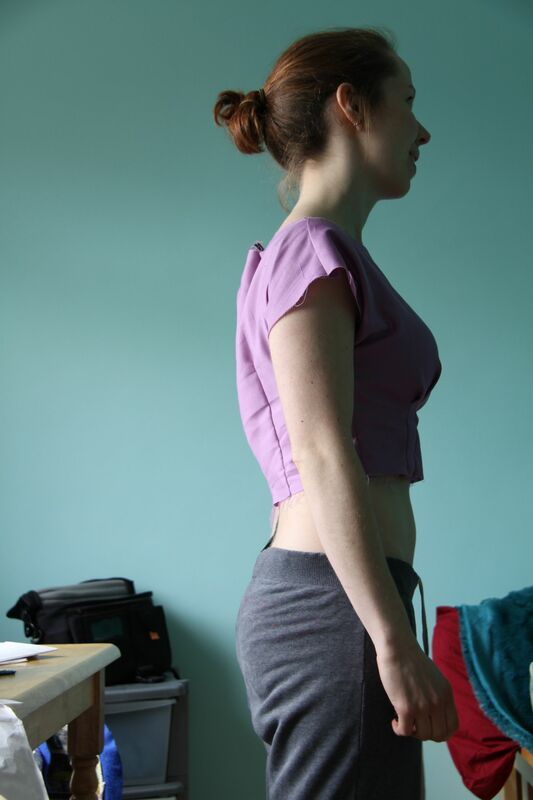 But just to complicate matters, I’ve lost quite a bit of weight since then – I now have a 34 inch bust, 27 inch waist, and 33 inch high bust. So, looking at the measurements, and with only an inch difference between my bust and high bust measurements, I thought that a straight US6/UK10 might actually fit. 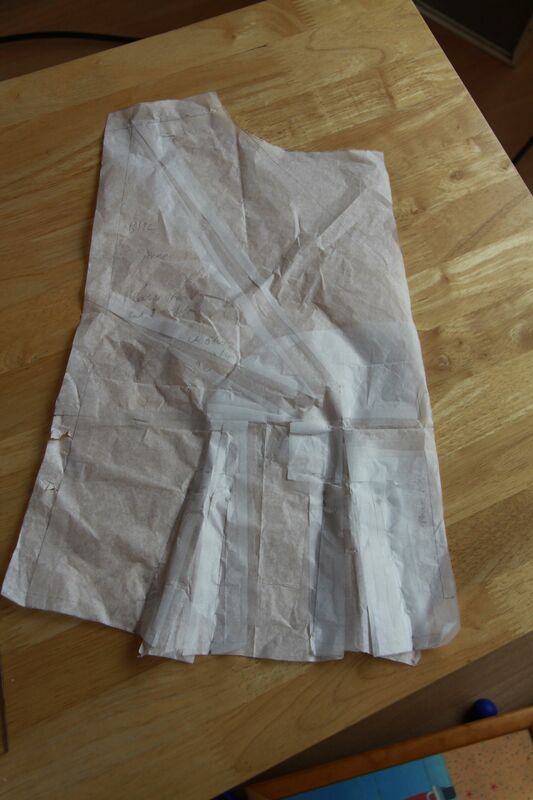 So I traced off the pattern and sewed up a toile. And I’m not really sure what to do with the results. I’m not sure why this is – it’s not a problem that I noticed having on my last version. 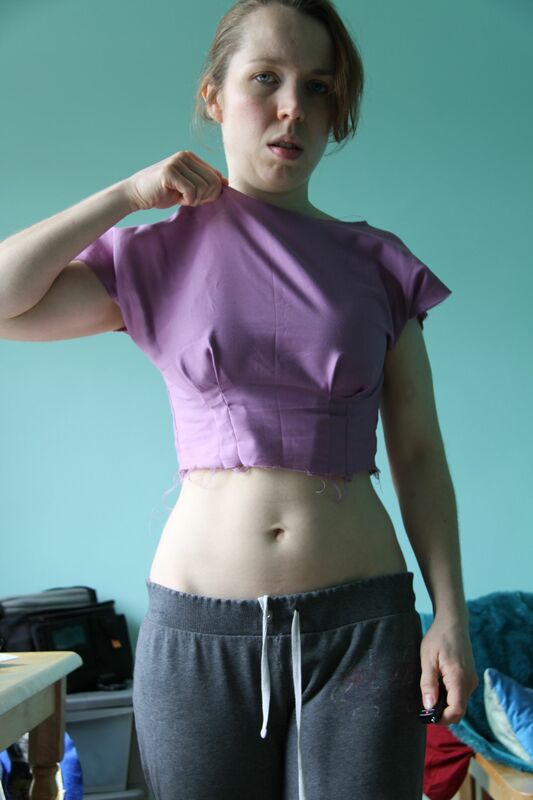 I just don’t know where the extra fabric is coming from – if I’d chosen the size based on my upper bust measurement and done an FBA, I’d only have made one size smaller. 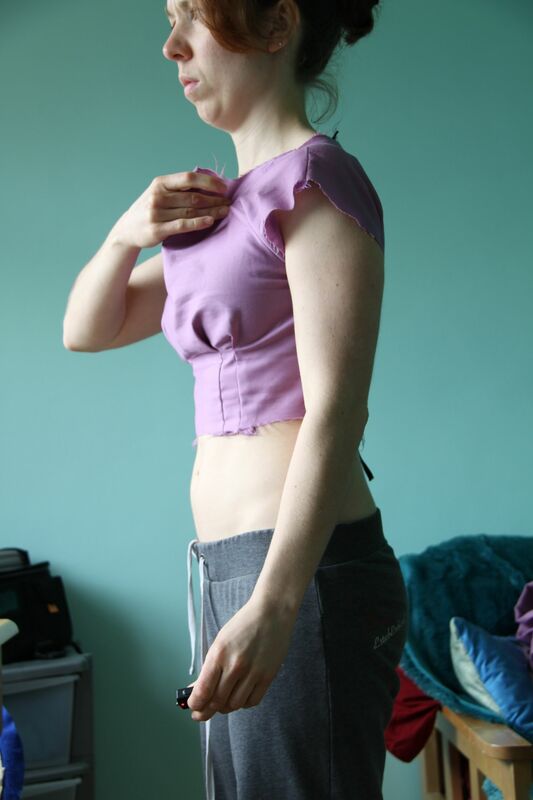 When I did the fitting course with fit2sew, I didn’t have any issues with needing a hollow/scoop chest adjustment, although maybe that could have changed since I’ve lost weight? 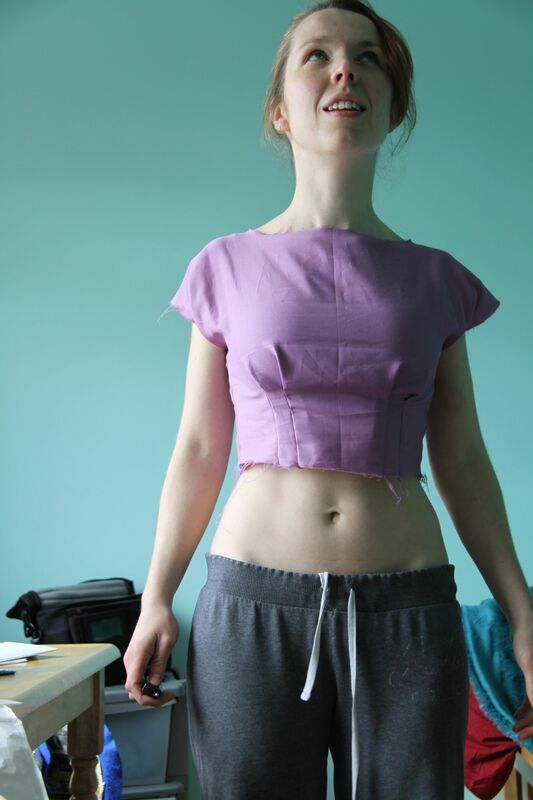 The pleats aren’t sitting exactly where I think they should under my bust either. Ignore my right hand side in this pic, as they seems to have risen up a little, but if you look at where my hand is on the left, my middle finger is at the top of the pleat stitching, and my thumb is on the bottom of my bra, right underneath my bust. I don’t think there should be that much of a gap. It certainly feels like a better fit when I pull the bodice up slightly so that the pleats sit directly under my bust, but then there’s a good inch or so excess above my shoulders, although it’s not amazingly clear in this pic. Bizarrely, I’ve also had the same issue recently with two RTW dresses – they’ve always been fine before, but I wore them both recently and spent the whole day each time pulling the dress up at the front, to save from flashing my bra at everyone, but when I did that, the dresses were way too long in the upper bust area. It’s almost like the space between my shoulders and my bust has shrunk! So i’m just trying to work out where I should go from here, and any advice or guidance anyone can give would be much appreciated. do I need an FBA after all? And if so, does anyone have a good method for an FBA on an Anna? I don’t like the idea of adding a bust dart like the FBA BHL did in their sewalong. I was going to try using Alison’s tutorial, although she does say that’s for adding 1.5 inches or more, not sure if it would work for a smaller FBA? Or do I not need an FBA at all? Is there something else I’m missing? I’ve decided that I really want to conquer the fit on this. 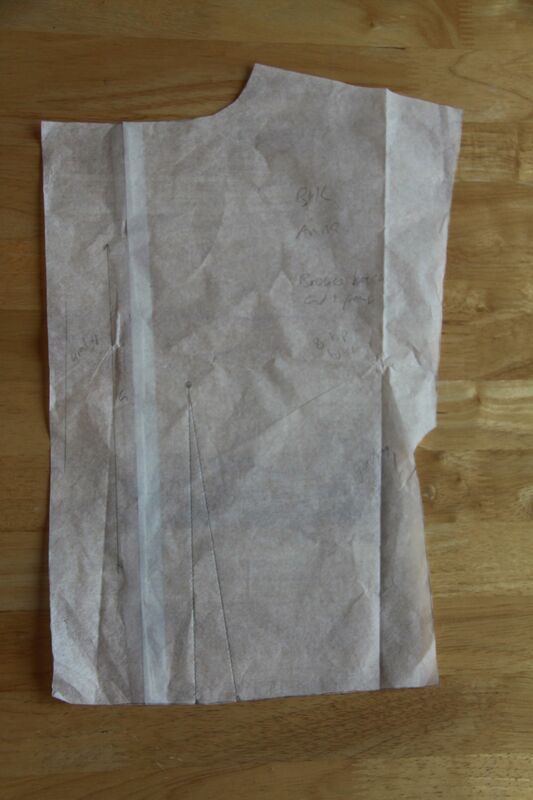 I have to admit, even though I’d decided to fit it properly, and gone to the effort of making a toile, I was half tempted just to say ‘it’s good enough’ and sew it up anyway. Mainly out of lazyness and lack of time and just wanting to get something sewn up. But I know that I wouldn’t be happy with it, and I’m much better off taking my time and doing a proper job, especially as I want to make more versions of this dress, so having a well-fitting pattern will be invaluable. But sometimes I find it hard to make myself slow down and actually take the time to get the fit right, especially when I’m making something as part of a sewalong and therefore have a deadline for getting it finished. But you know what, if I don’t get it finished in time, so what? I’ll still get the dress at some point, and I’ll be much happier if I take the time to make it fit properly. So instead i’m going to turn the fitting into a challenge, and I am determined to conquer it!